Afghan President Hamid Karzai had "sharp exchanges" about the nation’s recent election with Richard Holbrooke, America’s top diplomat to the region, a senior administration official told CNN. “There was a back and forth over particular issues,” the official said, “We’re not going to deny that.” The meeting came in the midst of opposition candidates accusing the Karzai campaign of rigging the election. Early election results released Tuesday by Afghan election officials showed a slim margin separating Karzai and his main rival, Abdullah Abdullah. Nevertheless, a Cabinet minister in Karzai’s government said Monday night that Karzai had won with 68 percent of the vote, according to several media reports. Abdullah, who was foreign minister under Karzai, has accused the incumbent of rigging the August 20 elections in his favor. Six other presidential candidates have also called for an investigation into “widespread fraud and intimidation” that they said could cast doubt on the legitimacy of the vote. 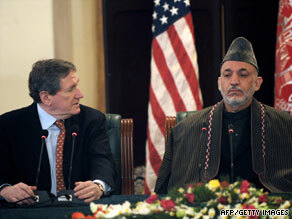 But unlike Abdullah, they did not accuse Karzai of having a role in the alleged fraud. “If that means it moves to a second ballot,” the official said Holbrooke told them, “then so be it.” Full results are expected to be released in mid-September. If no candidate gets 50 percent of the vote, there will be a runoff — most likely in mid-October.